Museums normally instruct visitors not to touch objects. But a groundbreaking exhibition at Manchester's Museum of Science and Industry Manchester is encouraging visitors to break the number one rule. 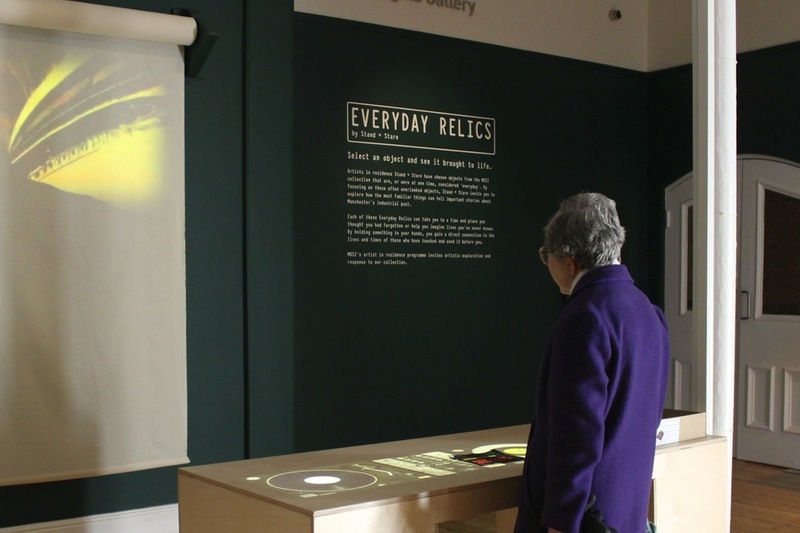 Everyday Relics by Stand + Stare Collective uses the latest in interactive technology to allow objects to literally tell visitors their story when they are touched. Brother-sister artistic duo Lucy and Barney Heywood have used technology normally associated with library cards or the Oyster card to activate 18 ordinary items from MOSI’s collection. Recorded oral histories, animations and photographs are activated by the innovative technology when the objects are picked up, revealing different aspects of MOSI’s collections. Stand + Stare Collective were commissioned as part of a new series of artists in residence who will respond to various aspects of the museum's distinctive collection. Focusing on the handling collection, Lucy and Barney reveal how even the most inconsequential seeming object can tell important stories about Manchester’s past. “The objects in this exhibition are a tangible link with the past that visitors can hold in their hands," says Lucy. By picking up an oyster shell, visitors will hear curator Meg McHugh explain how oysters were once a common food in Britain; rather than being discarded from a fancy restaurant, this oyster shell was probably the remains of a railway worker’s lunch from the mid-19th century. More recent histories can be uncovered as well. A touch of a 7” vinyl record of Gary Clail’s ‘Human Nature’ takes you back to Manchester’s club scene in the 1980s with Hacienda DJ Dave Haslam. Manchester’s international links are also explored via a piece of African fabric, which when touched begins film footage shot in Africa, revealing the meaning of the remarkable pattern, manufactured in Manchester according to tribal designs. The artists also donated one of their own family relics to the exhibition. When the small cash tin, dating from the mid-19th century, is chosen, a family tree spreads across the table as their father explains how the tin belonged to their ancestors who ran a bank in the city. The histories the objects tell are sometimes unexpected: for example, a milk bottle is used to tell the story of the 1984 miner’s strike. When the bottle is placed on the exhibition table, milkman George Cotton and his wife Shirley explain how they delivered free milk to the miners. “Lucy and Barney have created a new installation which helps us to connect with items that were once common aspects of peoples’ lives," says MOSI Director Jean Franczyk. Runs until June 29 2014.